Camerata RCO is a unique ensemble. We are all members of the Royal Concertgebouw Orchestra in Amsterdam and we enjoy playing in the orchestra tremendously. However, we like to expand this joy by playing together in a small ensemble as well. Not only is the repertoire of a small ensemble different, we also feel that chamber music is more personal and intimate. It is refreshing to get to know our colleagues in the orchestra better while working together in Camerata RCO. We are completely free to choose the repertoire we play, where we play it and with whom. With Camerata RCO we like to be in close contact with our audience. The energy that results from these concerts is what inspires us most. Camerata RCO plays many concerts in the Netherlands and abroad. The ensemble has residencies in Spaarndam and Dordrecht, as well as Festival Amfiteatrof in Levanto, Italy. We have performed in such cities as New York, Minsk, Tokyo, Seoul, Vienna, Rome and Madrid. 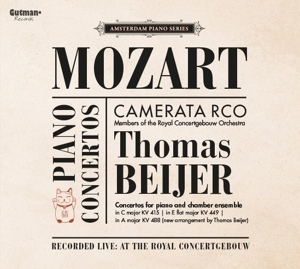 Camerata RCO has appeared on many radio and television broadcasts and has recorded several CD’s (Corelli, Mozart, Mendelssohn, Ravel) with the Gutman Records label. Our latest CD was released in September 2014 and it features Mahler 9th Symphony for chamber ensemble under the baton of the talented Spanish conductor Gustavo Gimeno.